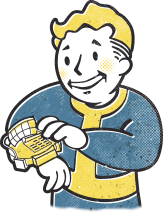 Collecting twenty premium-quality posters from Bethesda Game Studios' award-winning video game Fallout 4, this compilation of removable prints features gorgeous art specifically selected by the game's lead artist! Enjoy exotic "postwar" images of Power Armor, Deathclaws, and more--each suitable for hanging above your bunk in Sanctuary Hills with the Minutemen or in your quarters at the mysterious Institute. . Every piece is printed on sturdy gallery quality stock and coated with a gloss varnish to protect and showcase the art. Whether you're a casual fan of amazing art, or a grizzled wasteland wanderer, this poster book is sure to be a valued addition to your settlement.